Am I missing something? I can only see the booties pattern. I would love to get both the hat and the booties. Have you just not put the hat up yet? 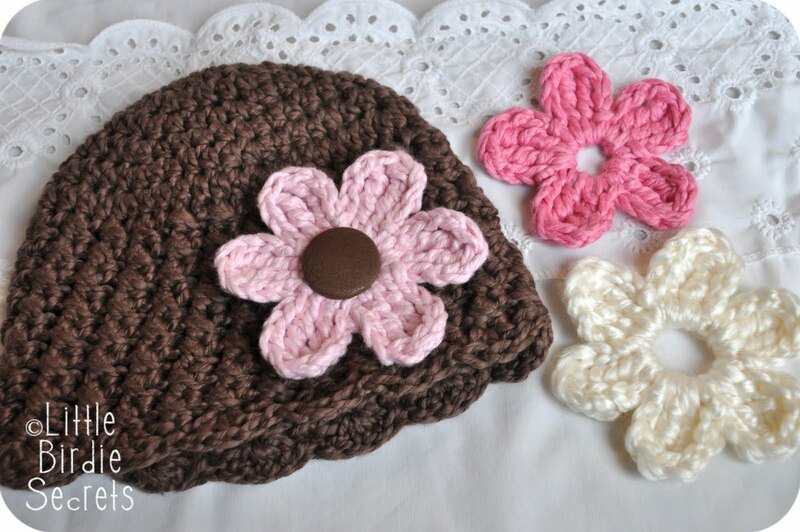 the changeable flower hat (with button) is such a clever idea ! Serious cuteness!!! Sure wish I knew how to knit. Well, no, I don't really, but it's just so dang cute!! Adorable and the models too! This is SO cute!!! I went to check it out in your shop, but the hat isn't there? I love the hat!!! So precious! Can not WAIT for the pattern in toddler size!! Thanks for sharing the flower pattern!! LOVE it!! I love ALL your flowers! You are VERY talented!! As for yarn, I have a few favorites. I usually go for a cotton or cotton blend for babies, because I like the look and feel of it. My faves are Lion Brand's Cotton Ease, Microspun, and Cupcake. There's a sale on Lion Brand yarn going on now at JoAnn! Oh, and I just updated the post to mention that I usually do two strands of yarn on the six-petal flower so it's a little more stable (not floppy). THESE ARE SO CUTE, I CAN HARDLY CONTAIN MYSELF!!!! Adorable! Any chance of you adapting it to a preemie size too? Oh my God! so cute.. I'll be watching for the adult size. It's really cute, but the baby is absolutely the prettiest baby I've seen in a long time. So excited for a baby pattern to work on. I am playing the waiting game for my second to get here and made the pumpkin/berry hat last night. Can't wait for you to post toddler size so that I can make a matching hat for my 1st! Cute booties and hat! Those flowers are great too. I was successful with the other flower instructions so I'm going to give this one a try too! So I just learned a new word from reading your blog post because up until now I had no idea what a cloche was. Is it wrong that I had no idea what that was? What a great idea!!! It's adorable!! Could I learn on this pattern, or is it more advanced than that? Loving these!! I added a link to it on my blog- so cute! I think the shop is out of hat patterns again...I'll check back soon, though!!! Really wanting the bootie pattern, but I don't see it. Is it sold out, and if so are you going to have more soon? Okay...so I CANNOT crochet (and don't have the time at all to learn right now.) Would you be willing to sell any of these sets? 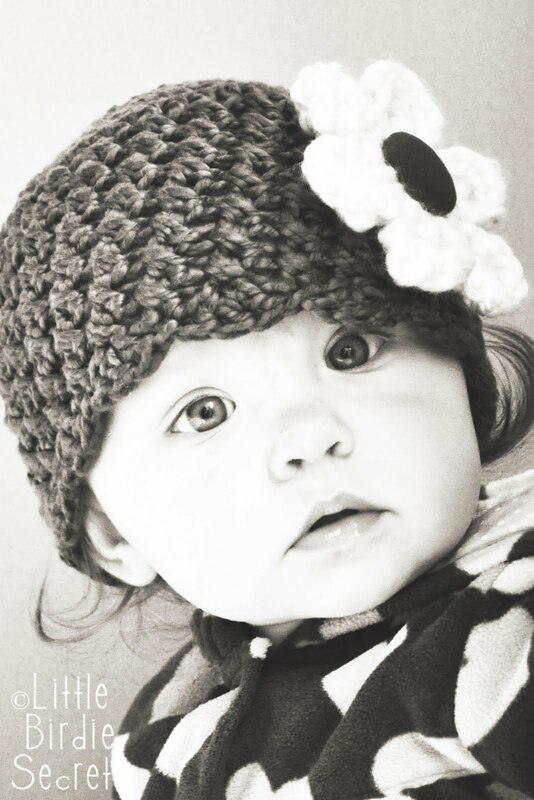 (I would need a size 3-6 months for my niece:) If so, email me at kirbyapel(at)gmail(dot)com. I love this hat! I like the contours of it, and of course the interchangeable flowers are awesome. I have been saying for months that I needed to figure out a way to do that, so I was extra thrilled to find your flower pattern!! 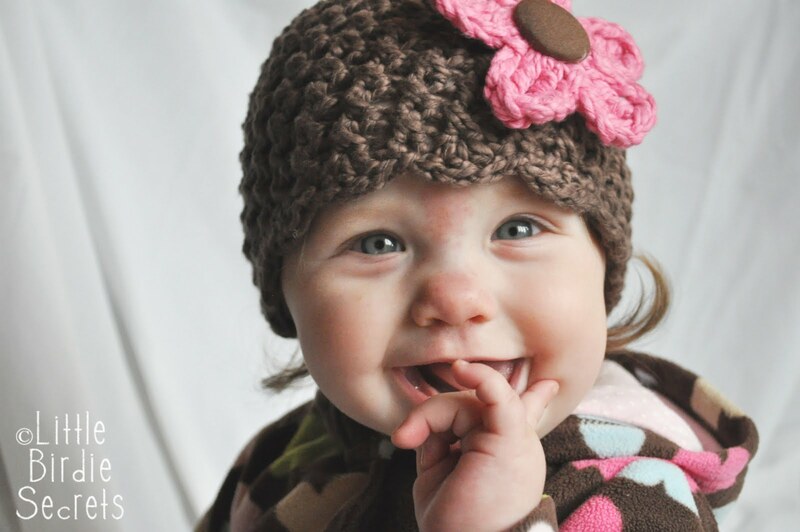 I'm trying to decide on a hat pattern for my daughter. What stitches do you use for this hat? Is it a different/more difficult stitch that makes the little ridges? I just had to say how much I love this pattern. 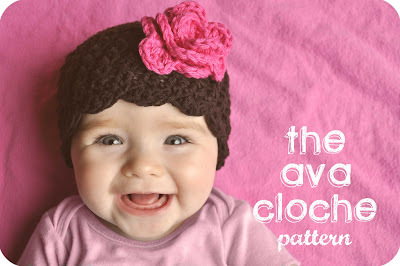 I bought the Ava Cloche pattern late Monday night and received the email within just a couple of hours. 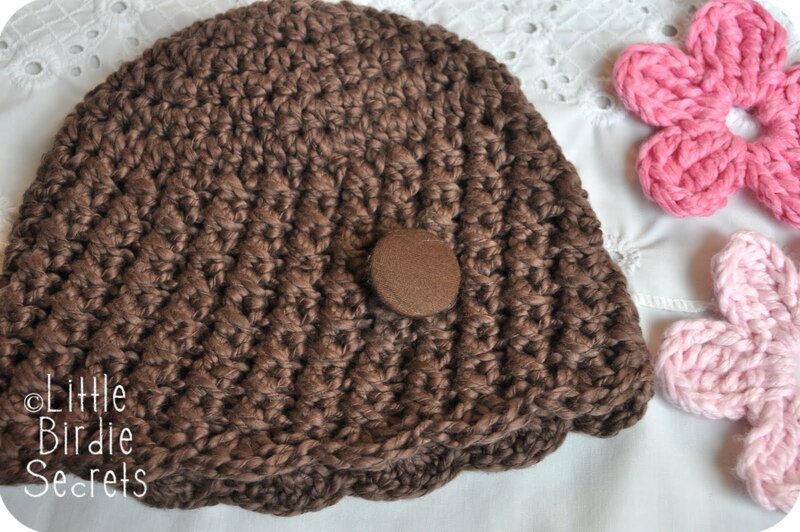 This is by far my favorite cloche/beanie pattern I've made. It was so quick and easy, and looks absolutely kissable on my 18 month old. I made 3 hats over Tuesday and Wednesday, and I've gotten so many comments on them. I can't say enough how great this pattern is. And the interchangeable flowers make it even that much better. Thanks so much!! I just tried to go to your etsy shop to purchase these patterns, but they aren't there. Are you out of stock? 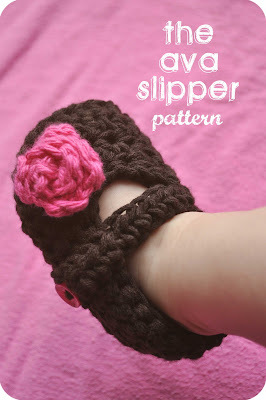 I'd really like to make these booties for my pregnant friend who just found out she's having a girl! Please let me know! I am in love with this flower pattern! I made 6 already! I am going to buy the hat pattern to make some hats for gifts :) Thanks so much! I really really want to buy this pattern, but I can only find the pattern for the cloche, are you still selling the one for the booties? That's what I'd prefer to buy, since I've bought all your other hat patterns :) Thanks! Have you more of the hat pattern available (with the daisies)?? Tried your link but the pattern appears to no longer be available in your shop? Can you let me know when it is again? Hi! These are adorable! 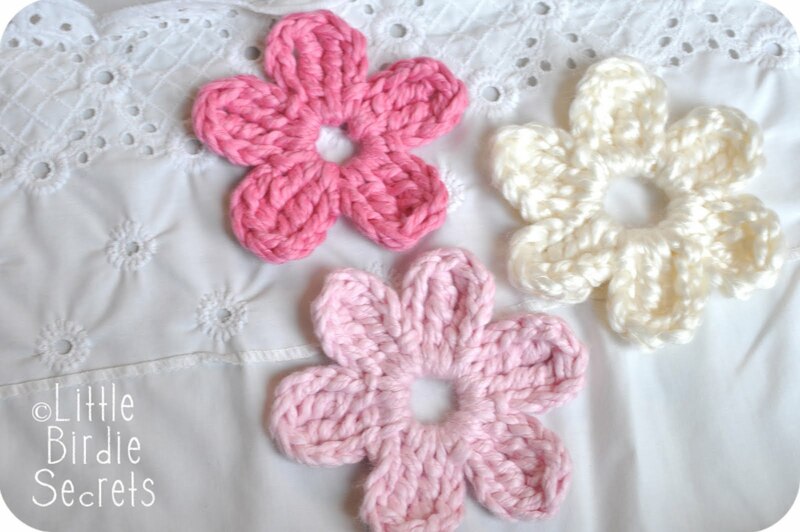 I do not crochet and i will not...I just want to bay these for my baby girl! Please tell us how to buy them! thanks! I do not see any pattern for the cap. Please let me know when it is available for purchase. 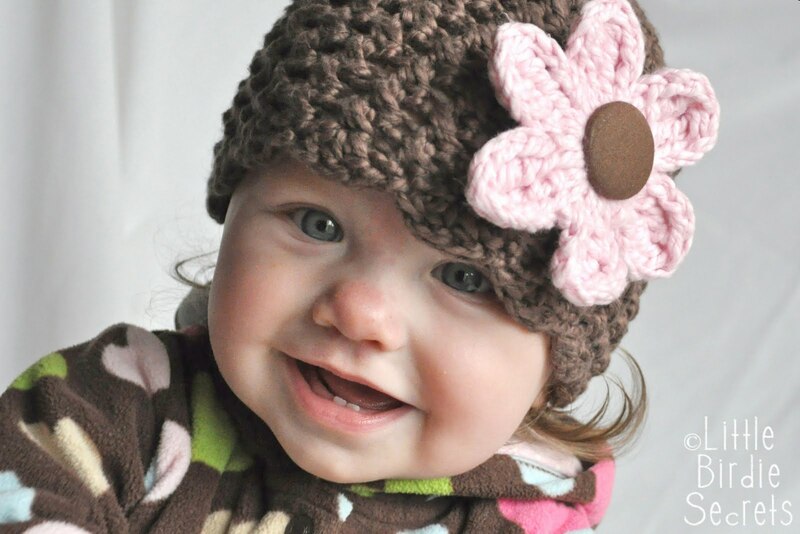 Beautiful hat & flower! I am not familiar with the term "tc". Could you explain that please? Thanks! What does tc mean in the flower pattern? When I googled 'tc' treble crochet appeared. 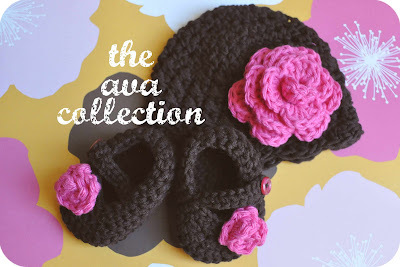 Is it still possible to get the Ava slipper pattern?